Providing you the best range of cpvc pipe 1.1/2, cpvc pipe 3/4, cpvc pipe 11, cpvc pipe 1.1/4, cpvc pipe 1/2 and cpvc pipe 2 with effective & timely delivery. We are highly recognized firm instrumental in developing finest grade 1.1/2 Inch Pipes SDR 11. We take special considerations to the standard specifications of set industry regulations and develop the remarkable range of CPVC pipes that are ideal for potable hot and cold water distribution applications. Designed precisely at our well integrated setup the offered range features remarkable physical properties. Further, we procure the premium grade poly vinyl chloride compounds to fabricate these fire-retardant pipes that can be ordered from us in bulk quantities at competitive price. Leveraging on wide expertise, we are instrumental in developing best quality 3/4" Inch CPVC Pipes SDR 11. We are procuring finest grade raw materials to fabricate the most reliable range of pipes for potable hot and cold water distribution. Specially engineered for both high and low rise buildings the offered pipes are compliant to the highest industry standards. Further, we are leveraging the next generation techniques to manufacture these pipes with uniformed thickness and smooth surface finish that can be availed from us at the best price in the industry. With the aid of our highly experienced professionals, we are instrumental in developing finest grade 1" Inch CPVC Pipes SDR 11. We present the most advanced grades of CPVC pipes that are UV stabilized and feature remarkable resistance against scale formation. Fabricated from finest grade poly vinyl chloride compounds the high performing pipes are suitable for hygienic water supply at homes, hotels and offices. Further, we are developing SDR 11 and SDR 11 class of pipes that can be ordered from us in varied thickness and pressure ratings at a nominal price. 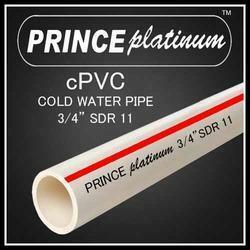 We have been counted as major firm offering high performing 1.1/4" Inch CPVC Pipes SDR 11. Our team members are working hard to present the industry compliant range of CPVC pipes that are ideal for hot and cold water applications in homes, hotels and hospitals. These pipes are precisely developed at our well integrated setup and featuring assurance of superior resistance to chemicals and corrosion. Further, these fire retardant pipes are made from finest grade CPVC compounds and can be ordered in varied wall thickness and pressure ratings at a leading price. We have been counted as major firm offering high performing 1/2" Inch CPVC Pipes SDR 11. Our team members are working hard to present the industry compliant range of CPVC pipes that are ideal for hot and cold water applications in homes, hotels and hospitals. These pipes are precisely developed at our well integrated setup and featuring assurance of superior resistance to chemicals and corrosion. Further, these fire retardant pipes are made from finest grade CPVC compounds and can be ordered in varied wall thickness and pressure ratings at a leading price. We are highly recognized firm instrumental in developing finest grade 2 Inch Pipes.SDR 11 We take special considerations to the standard specifications of set industry regulations and develop the remarkable range of CPVC pipes that are ideal for potable hot and cold water distribution applications. Designed precisely at our well integrated setup the offered range features remarkable physical properties. Further, we procure the premium grade poly vinyl chloride compounds to fabricate these fire-retardant pipes that can be ordered from us in bulk quantities at competitive price.